"Pooh Bear" is a fulltime Lake Erie Ohio fishing guide that offers both fishing and leisurely Island tours aboard his massive 41' Viking fishing charter boat. Rest assured this first-class Captain's vessel stays over the fish as they move throughout the season. 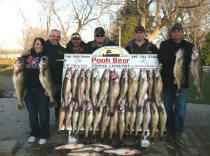 Pooh Bear Fishing Charters is devoted to the Lake Erie fishing charter business that combs the southern shores of the famed Great Lake between Toledo and Cleveland Ohio, following the "best bite" as the walleye make their annual migrations. From spring into summer, Anchors Away Marina in Marblehead Ohio, near Port Clinton is the port of choice for fishing. As autumn approaches, it's on to Vermilion Ohio. 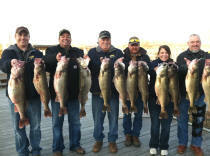 Fishing Lake Erie for walleye can be challenging at times, especially with weather events that get average fishing boats a rockin'. 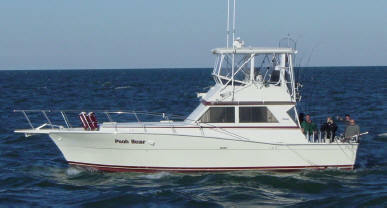 Pooh Bear's 41' Viking fishing charter boat provides a safe and trustworthy ride. Designed and built for ocean travel, the big fishing boat handles Lake Erie with ease. Have confidence that the Viking will provide the most comfortable and enjoyable fishing charter experience for you and your group. Captain and Fishing Guide Keith Unkefer aka "Pooh Bear" takes great pride in his unique Lake Erie Ohio fishing charter boat. The fishing charter boat's cabin comes complete with air conditioning, private bathroom, and comfortable lounge furniture. (Although when the walleye are on, there is little time for sitting!) 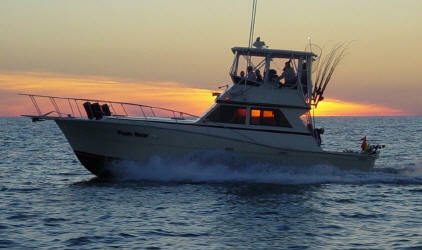 Captain Keith's big fishing charter boat also offers a roomy casting and landing area. The extra wide beam provides plenty of space for fish fighting action. Whether it's walleye, steelhead, smallmouth bass, or perch you're after (trolling or casting), fishing from the Pooh Bear fishing charter boat is an experience as sweet as honey. Call Captain and Fishing Guide, Keith Unkefer today to schedule your Lake Erie charter fishing trip or sightseeing cruise on the big, comfy Pooh Bear fishing charter boat. DO YOUR LAKE ERIE FISHING CHARTERS ABOARD THE 41' LAKE ERIE FISHING CHARTER BOAT "POOH BEAR"
Why charter those small open Lake Erie charter fishing boats when you can charter the large 41' Fishing Charter Boat "Pooh Bear" which is much more comfortable, safer and a lot more fun for your Lake Erie fishing charters?